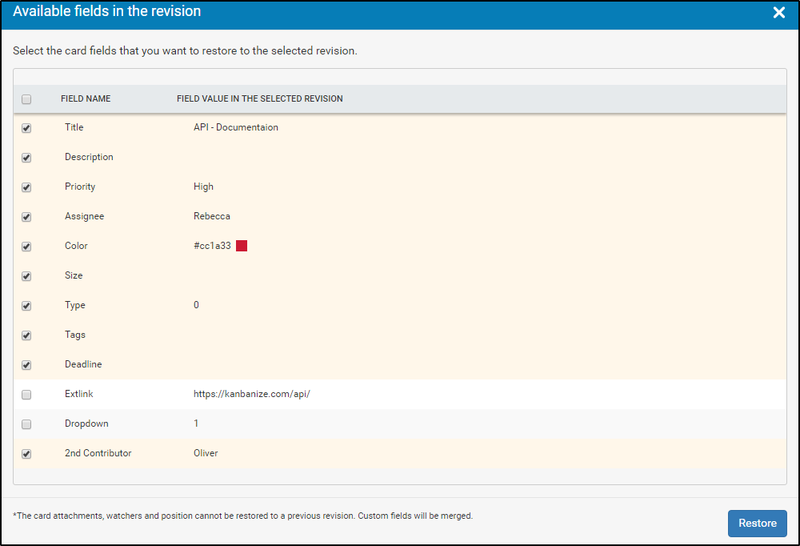 The card revisions business rule will save a new card revision every time a card property is changed (it is configurable which properties are to be tracked). The most popular scenario would be the creation of a new revision when the card's description is changed. Go to your Administration panel by clicking on Administration at the top right of your screen. Open the Business rule tab -> select the "Card revisions" tule tab. 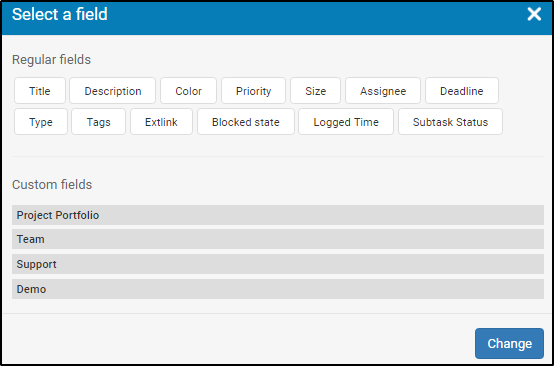 In the Name and Description fields, you can change the name of the rule and describe the scenario you will achieve with it. This way you can create an overview of your active business rules, as upon creation every automation is present in the Business Rule panel. You can share the rule with other users (e.g. a Workspace Manager), if appropriate. In this case, they will be able to edit/disable/enable the rule. 1. WHEN - Here you define which card fields are to be tracked. You can configure the rule to save card versions if any field or only particular filed/s are changed. Click on Any Field -> select a field-> click on Change. You can add additional fields by clicking on Add new field and repeating the steps. 2. AND - Here you define the filters, which specify the conditions under which the actions should be triggered. Board: the board filter is mandatory for this business rule. There are two options: Board is/is not - select one of the options from the dropdown. Define the board from the board name dropdown menu. Click on "or" to add extra boards and optimize the scope of the rule. Use the minus sign to remove a board. Click on the Add new property button to add extra filters, if necessary. Select a Regular field or/and a Custom field -> click on Add. For all time-related fields, you can select the following units: Days, Hours, Minutes, Seconds. 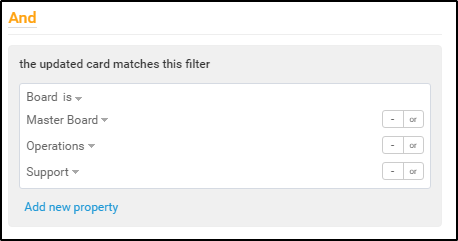 When you have added the filter, set it up by clicking on Not set or enter a value. Note: You can add as many filters as you wish by clicking on Add new property and repeating the steps. 3. 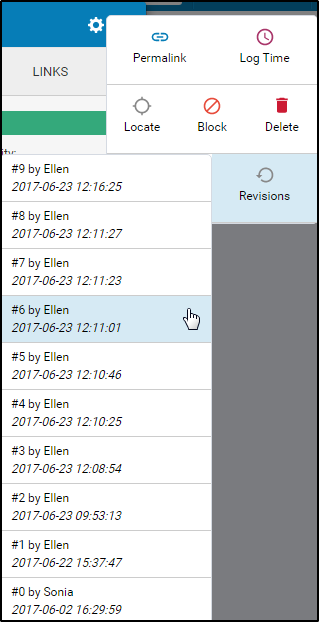 THEN - Card revisions will be saved when the selected card fields in WHEN are changed and the card meets the criteria set as filters in AND. To enable the rule-> click on the green check mark at the top right corner of the configuration panel. Click on the red x-sign to cancel the creation of the rule. Note: Only users with "Account Owners" or "Manage Business Rules" privileges can create business rules. How to Restore a Card Version? To restore a previous version of your card -> open the card -> click on the card settings (the gear icon) -> select "Revisions" -> choose the version you wish to restore. 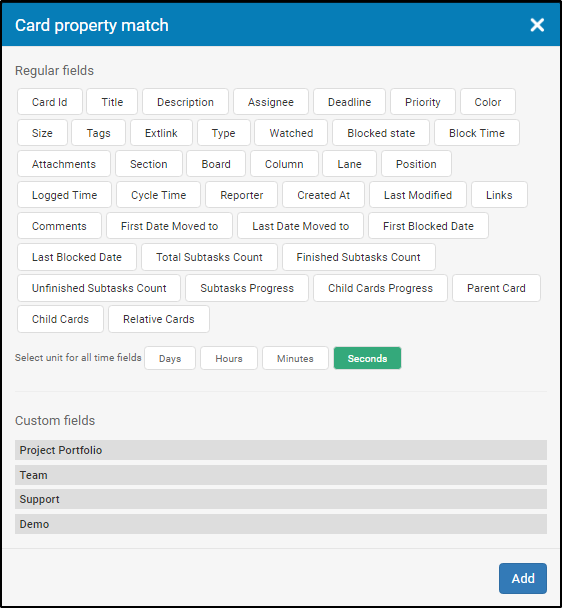 Choose which card fields you wish to restore by setting a check mark -> click on Restore and select Update Card to save the changes. Important: The card attachments, card watchers' and position cannot be restored to a previous revision. Custom fields will be merged. If the "Card Revisions" business rule is enabled, card versions can be restored by all users in the account.